Sonos services paired with SiriusXM gives restaurants, hotels, retailers, and other businesses a powerful, easy-to-use business music solution to enhance the customer experience. NEW YORK, May 20, 2016 /PRNewswire/ — SiriusXM and Sonos today announced the debut of SiriusXM Music for Business on Sonos. SiriusXM will demonstrate SiriusXM Music for Business at the National Restaurant Association show in Chicago, from May 21-24, in booth #4578. SiriusXM Music for Business is now available for the first time for businesses using Sonos wireless products. The easy-to-use Sonos app enables restaurants, hotels, offices, retailers, and other businesses to integrate SiriusXM’s wide-variety of licensed commercial-free background music from every genre without additional equipment. SiriusXM Music for Business paired with Sonos systems allows businesses to meet the unique requirements of each environment and enhance the customer experience. “Now that SiriusXM Music for Business is fully integrated into the Sonos controller app, business owners can get the same simple, all-in-one solution that Sonos users enjoy at home to bring the commercial-free music they love from SiriusXM into the workplace and retail environment,” said Andrew Vloyantes, Global Business Development manager for Sonos services. SiriusXM business music streaming delivers 105 commercial-free internet music channels, more than 30 of which are interruption-free, to keep customers engaged, energized and entertained. All content is licensed and legally available for business use. For more information about SiriusXM Music for Business and Sonos retailers and dealers, please visit www.sonos.dynamicmediamusic.com. Attention SiriusXM Music for Business streaming clients. We have good news! SiriusXM Music for Business is adding 13 new channels of exclusive SiriusXM content to its streaming business service. Business subscribers will now enjoy an extremely diverse array of commercial-free music spread over 95 channels that are all licensed and legal for business use. To take it even further, SiriusXM has developed a Limited Edition business channel that will play special “pop-up” content, giving businesses access to themed holiday music and live special events. All SiriusXM streaming business clients will automatically receive the new Sirius music stations beginning August 13, 2015. If you have questions or would like to learn more about SiriusXM music for your business, contact Dynamic Media at 1-800-684-7050. Here are all the details on the new channel expansion! SiriusXM will be launching its expanded Music for Business catalog on August 13, 2015. The expansion applies to business streaming customers only. This does not apply to consumer accounts, nor does it apply to business satellite customers. The new SiriusXM channel lineup will automatically appear on your radio. All you have to do is tune in and enjoy! 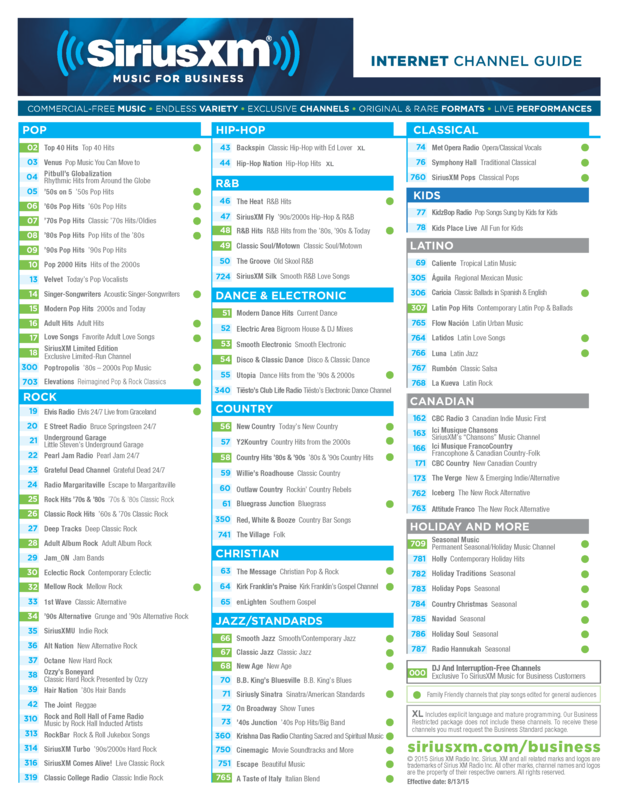 Here is the Sirius xm radio channel guide! The 13 new SiriusXM music channels designed to round out your business music experience. The new streaming music channels were selected and programmed based on feedback from business subscribers just like you! To keep things organized and intuitive, SiriusXM moved some existing channels to new channel numbers. See the chart below for a list of everything that has moved. Time to reset the presets! SiriusXM removed three channels. If you were affected by this, tune into our Recommended Alternative Channel to hear content similar to the channel that was removed. This expansion marks another move by SiriusXM to bring the best streaming content to businesses across North America. If you are interested about SiriusXM for your business, or have questions about the service, please contact Dynamic Media at 1-800-684-7050. Dynamic Media opens 1,000 additional slots for new dealers and lead-referral affiliates to earn recurring monthly commission on SiriusXM Music for Business products and services. Dynamic Media (www.DynamicMediaMusic.com) is expanding its national Dealer Affiliate Program for its leading suite of business background music products and services. To satisfy the intense national demand for SiriusXM commercial music services, Dynamic Media has opened 1,000 additional slots for new dealers and lead-referral affiliates. Authorized dealers and lead-referral affiliates will earn recurring monthly commissions on SiriusXM subscriptions along with special wholesale pricing on SiriusXM hardware. Businesses interested in reselling SiriusXM music for business services are encouraged to apply online at www.dynamicmediamusic.com or to contact Dynamic Media at 800-684-7050. Dynamic Media, one of the largest and fastest-growing music for business providers in the country, will be managing all aspects of the Dealer Affiliate Program. The program is structured to support both Dealer Partners and Lead-Referral Affiliate Partners. Dealer partners directly sell and implement SiriusXM business products in client locations. Sirius dealers receive wholesale discounts on SiriusXM products for resell to their clients. Lead-Referral Affiliate partners include franchisers, consultants, purchasing co-ops and others that refer leads using co-branded marketing tools developed by Dynamic Media. Dynamic Media provides all sales and implementation services on all referred leads. Both dealers and lead-referral affiliates earn recurring monthly commissions on all subscriptions generated through the program. The SiriusXM Music for Business packages provide business owners with the widest selection of programming available with SiriusXM radio content that that spans over a dozen music genres. The SiriusXM background music is streamed directly to a subscribing business over the internet or via satellite and plays through a SiriusXM player. The monthly subscription fee starts at $29.99 and includes all public performance licensing (ASCAP, SESAC & BMI) for most types of business. The player features business-friendly features that include channel blocking, wireless control, and easy self-installation. To apply to become a Dynamic Media dealer or affiliate, please visit www.dynamicmediatest.com/become-a-dealer/. For more information on the Dealer Affiliate Program or our commercial online music service, contact Dynamic Media at 1-800-684-7050. Dynamic Media is an authorized SiriusXM Music for business reseller and one of the nation’s fastest-growing music for business providers in the country. Headquartered in Sterling Heights, Michigan, Dynamic Media provides background commercial music services, DirecTV for business, customized on-hold and in-store messaging services and commercial audio systems. Dynamic Media offers turnkey solutions that include sales, service, and post-installation support for thousands of subscribers in the U.S. and around the world. Dynamic Media employs a network of partner technicians that reach every zip code in the United States. The commercial music services company was co-founded by Dr. Ryan Santangelo and his brother Pete Santangelo over ten years ago. Find out more at www.DynamicMedia-US.com. Dynamic Media invites commercial AV Integrators, contractors, and consultants to visit booth 4425 at CEDIA to join the as part of the dealer program to earn recurring monthly commission on SiriusXM Music for Business products and services. Dynamic Media, an authorized reseller of SiriusXM Music for Business, is extending an exclusive invitation to all pro A/V integrators, contractors, consultants, Sirius dealers and sales professionals to join their dealer program and earn recurring commission on products like SiriusXM Music for Business. Businesses interested in earning monthly commissions on SiriusXM Streaming Music for Business products can sign on as an Authorized Dealer or Lead Referral Affiliate at the Dynamic Media booth at CEDIA 2013. Dynamic Media representatives will be on hand to answer questions and on-board dealers during the CEDIA show hours at booth 4255. SiriusXM Music for Business is one of the widest and most diverse background offerings available in the industry today. Available in both satellite-delivered and internet music streaming options, the SiriusXM Internet Music for Business package provides business owners with over 80 channels of music content that spans over a dozen genres. The SiriusXM background music is streamed directly to a subscribing business over the internet or by satellite and plays through a SiriusXM Music for Business player. The music systems include business-friendly features that include channel blocking, wireless control, and easy self-installation. The SiriusXM music service provides over 80 channels to choose from and includes public performance licensing (ASCAP, SESAC & BMI) for most types of business starting at only $29.99 per month. Businesses interested in joining the Dynamic Media dealer program are encouraged to apply online at www.dynamicmediamusic.com or to contact Dynamic Media Sirius consultants at 800-684-7050. Dynamic Media is one of the largest and fastest-growing business music providers in the country. Headquartered in Sterling Heights, Michigan, Dynamic Media provides background music for business, DirecTV for business, customized on-hold and in-store messaging services and custom music players. Dynamic Media offers turnkey business music solutions that include sales, service, and post-installation support for thousands of subscribers in the U.S. and around the world. Dynamic Media employs a network of partner technicians that reach every zip code in the United States. The company was co-founded by Dr. Ryan Santangelo and his brother Pete Santangelo over ten years ago. Find out more at www.dynamicmediamusic.com. Dynamic Media launches the SiriusXM Internet for Business service featuring over 80 channels of licensed business-safe music for $29.99 per month. Dynamic Media (www.DynamicMediaMusic.com), a leading national provider of business background music services, DirecTV for business, on-hold messaging, and in-store messaging, is launching the new SiriusXM Internet Music for Business offering. The new SiriusXM Internet radio services provide businesses with an internet-delivered background music package that features over 80 channels of programming. The SiriusXM Internet Music for Business package is available for most U.S. business for $29.99 per month and can be purchased by contacting Dynamic Media at 1-800-684-7050 or through their website at www.DynamicMediaMusic.com. The SiriusXM Internet Music for Business package provides business owners with the widest selection of programming available with SiriusXM content that that spans over a dozen music genres. The SiriusXM background music is streamed directly to a subscribing business over the internet and plays through a SiriusXM Internet for Business player. The custom music player features business-friendly features that include channel blocking, wireless control, and easy self-installation. The SiriusXM Internet for Business player retails for $199.99. The Sirius internet radio services provide over 80 channels to choose from, along with public performance licensing (ASCAP, SESAC & BMI) for most types of business for $29.99 per month. SiriusXM Internet Music for Business can be purchased with same-day shipping at www.DynamicMediaMusic.com or by calling Dynamic Media at 800-684-7050. Dynamic Media is a SiriusXM National Premier Partner and one of the nation’s fastest-growing business music providers in the country. Headquartered in Sterling Heights, Michigan, Dynamic Media provides background streaming music for business, DirecTV for business, customized on-hold and in-store messaging services and commercial background music systems. Dynamic Media offers turnkey solutions that include sales, service, and post-installation support for thousands of subscribers in the U.S. and around the world. Dynamic Media employs a network of partner technicians that reach every zip code in the United States. The company was co-founded by Dr. Ryan Santangelo and his brother Pete Santangelo over ten years ago. Find out more about streaming radio at www.DynamicMediaMusic.com.